My NYU-ITP Dynamic Web Dev class ended up being fantastic. We moved to Node.js Express, incorporated AJAX, MongoDB, Heroku, and Amazon S3, built a JSONic API, and toyed with socket.io and even some Processing + HTTP POST. You can read the class notes and fork/view the github class code from Professor John Schimmel’s repositories online. My final project ended up being a party game. People hit the site, probably best with a keyboard, and start creating “rhymes” based on a prompt of two topics, such as “yo momma” and “swag”, or “basketball” and “Maybach music”. 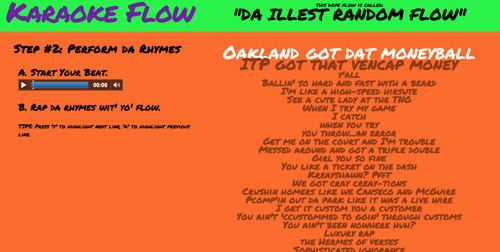 On the performance page, the next person up will (eventually) be able to grab a mic, start the random beat (so far I have random beats from Wiz Khalifa’s “Star of the Show”, Three Six Mafia’s “Hard Out Here for a Pimp”, and Drake’s “I’m on One”), and move up and down through the lyrics using the ‘j’ and ‘k’ keys. I’m hoping eventually it can be recorded and people can vote on the best rendition of the performance. People are judged (though this isn’t captured through the site yet) on how well they deliver their spontaneous flow. I wanted to do a project related to music and parties, hence the project; hopefully at some point in my life, I’ll get to work on projects that make parties more kickass through technological integration with human party impulses. 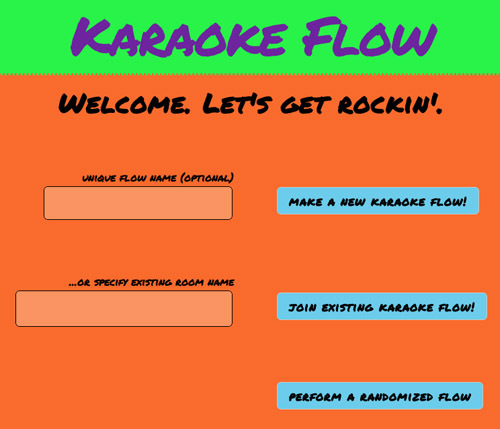 Karaoke Flow was also my entrée into Node.js and Express, which I now love and will rewrite Galapag.us into it over the summer in preparation for my thesis next spring. Previous documentation from my blog: post #1, post #2. Our professor showed us passport, which is a brilliant module for handling users and security. I was missing something similar when I was using Ruby + Sinatra. If anyone’s interested in taking this further with me, let me know. 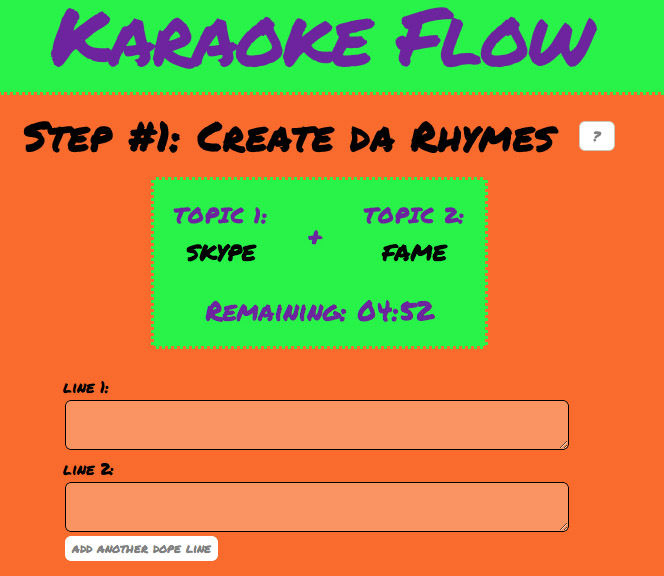 I definitely think some combination of karaoke, rhyme-writing, parties, and randomness would be a huge hit.